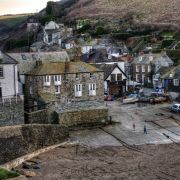 Where is Portwenn from Doc Martin? 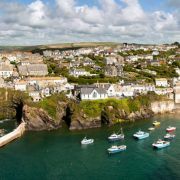 The Cornish fishing village of Portwenn is actually the lovely Port Isaac. 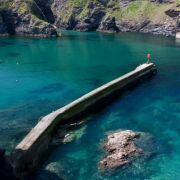 Located in the middle of the North Cornwall coast the village is a perfect jumble of whitewashed fisherman's cottages spilling down to the harbour along some unfeasibly narrow lanes. 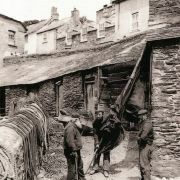 In the old days life revolved around the harbour with fishing and shipping the mainstay of the village. Times were good and this can be seen in the fine buildings around the harbour. However, Port Isaac was becoming a bit of a sleepy backwater. I remember visiting back in 2003 and thinking what a lovely place it was, but also wondering why it wasn't busier. 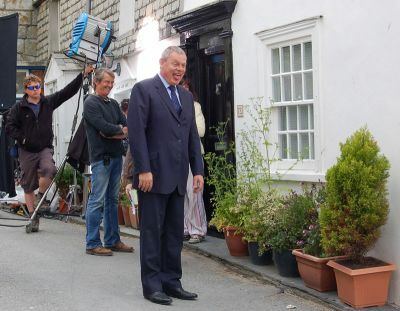 The arrival of Doc Martin in 2004, certainly shook things up and put Port Isaac back on the map. The British television comedy drama stars Martin Clunes as the grumpy doctor who's career as a surgeon has ground to a halt after developing a phobia of blood. The series has been hugely popular, regularly pulling in audiences of over 10 million viewers. Once word filtered through that the sleepy TV village of Portwenn was in fact Port Isaac it was like the pilchard boom all over again! Whilst many of you may think Portwenn is a name conjured out of thin air it isn't. Port Wenn was actually the old name of the nearby cove of Port Quin. There is also a reason Doc Martin is named Martin Ellingham. The creator of the series is Dominic Minghella; in case you haven't guessed, Ellingham is an anagram of Minghella! I remember hearing a quote from the North Cornwall based location manger who chose Port Isaac. 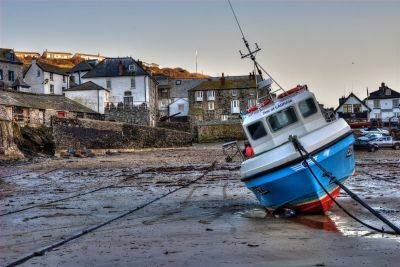 It went something along the lines of "There are plenty of lovely fishing villages throughout Cornwall, but none of them are just down the road!". 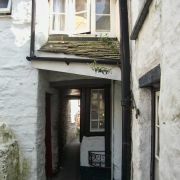 And so Port Isaac became Portwenn. 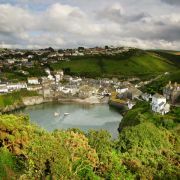 The Doc Martin series is not the first time Port Isaac's special qualities have been used in a film location. Much of the original 1970s Poldark television series was filmed here. More recently scenes from Rosamunde Pilcher's novel, The Shell Seekers, were filmed here in 2005. Back in 2000 Port Isaac was used as the location for the critically acclaimed comedy thriller, Saving Grace. In this film Martin Clunes plays the part of Dr Martin Bamford, a 'townie' doctor unversed in the ways of the local folk. It was from this film that the concept of Doc Martin was spun off, but with one change - the new Doc Martin was far grumpier!